The Video Music Awards closed out with a performance by Beyoncé that was seemingly the entire point of the program. The lead up to her appearance and her acceptance of the 2014 Michael Jackson Video Vanguard Award was long and paved with much mediocrity, but we were handsomely rewarded for our patience. First, Beyoncé showed up fashionably late, choosing to walk the red carpet without the distraction of the mortals. Then we got a glimpse of Blue Ivy and Jay Z, with Blue showing that she's already picked up the famous people habit of wearing sunglasses indoors. All the while, Beyoncé was teasing her performance on Beyonce.com, even though there was no ash and diamond-covered Bey during the actual show. We knew her performance—which clocked in at around 20 minutes—would be a doozy when the set list leaked earlier today . "MTV, welcome to my world," she said, welcoming the audience, and with that, it was gametime. 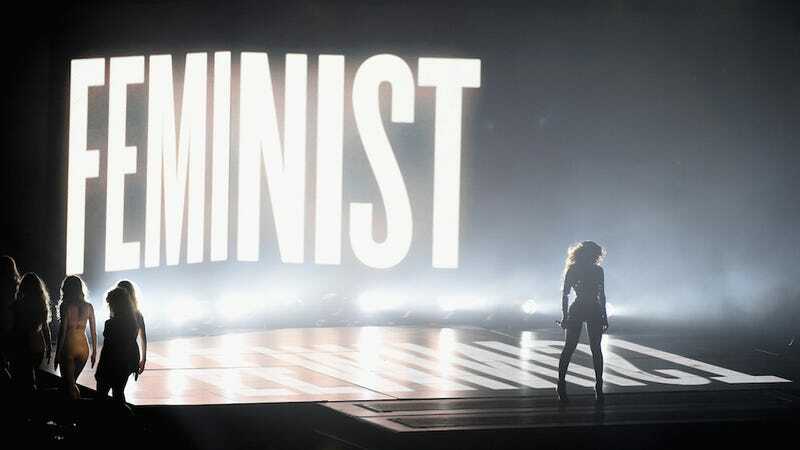 If you've seen Beyoncé in concert in the past year or so, this performance probably felt familiar, but no less impressive. She sang live, her dancing was on point and she looked stunning. Hate her or love her, (and yes, blah blah blah we know a lot of you hate her) Beyoncé is likely the finest living performer we have right now and she proved that again tonight. Beyoncé loves to answer questions without actually addressing or truly answering them. Yes, they may have shut me out of all the relevant awards tonight, but we all know the rest of these people aren't even in my league. And now I'm going to show you. Oh yeah, and all those divorce rumors? You'll see. Although many were hoping of a live performance of her "***Flawless" remix with Nicki Minaj, Beyoncé did play a brief clip from the part of the song where she most clearly addressed elevator gate. She also reminded you for the fifty billionth time that she is, indeed, a feminist. Throughout the night, MTV teased that a surprise guest would be presenting Beyoncé with her award. As you probably could have guessed, Jay Z and Blue Ivy walked onstage after the performance and presented her with the Moon Man. 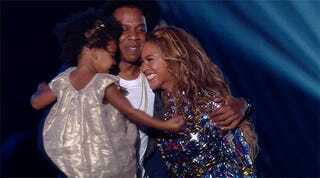 She thanked Blue—her "Blue Blue," her "beloved," Jay Z and of course, her fans. There was lots of kissing and general Carter adorableness. Looks like those divorce rumors might finally settle down, at least for now. But the most important moment of the entire night was when we learned that Blue Ivy loves doing the Flawless hands as much as everyone else.